Street Views: 6 and 12 Suppl. Whalley in Lancashire has been in the news this Christmas because of floods, which is obviously most distressing for the residents, but Whalley ties in with one of London’s shopkeepers that appeared in Tallis’s Street View, so I thought to start this post in Whalley rather than in London. 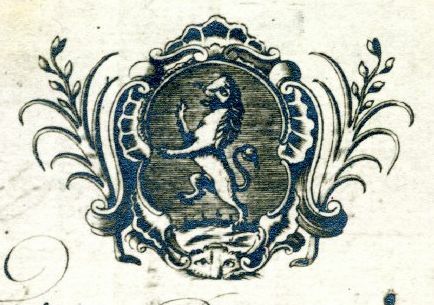 In 1756, one Henry Isherwood, the son of another Henry, blacksmith, late of Easterley in Lancashire, is apprenticed to James Isherwood, a Stationer of London. Easterley is very close to Whalley and there is still an Easterley Farm, just east of Whalley and south of the golf course. Henry senior died in 1748 and the burial record of the parish names him as the blacksmith of Whalley. When Henry junior was baptised in 1737, he is described as the son of Henry Isherwood of Easterley within Whalley, so I guess that Easterley was only a hamlet, or even just an extended farm, and did not have its own church. Twelve years earlier, in 1725, another son of Henry the blacksmith was baptised, Nicholas, but this time the father is described as “of Read”. Read is the next village along the road coming from Whalley towards Padiham. Keep this Nicholas in mind because we will come back to him later on in the story, but we will first return to Henry junior. Henry, at some point after his apprenticeship, went into partnership with Thomas Bromwich and Benjamin Bradley, and not only that, in 1766 he married Ann Maria Bromwich, the niece of his partner. 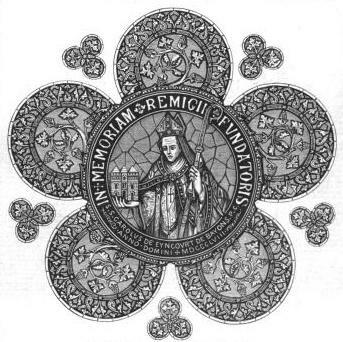 She was most likely the daughter of the reverend John Bromwich who was mentioned in Thomas Bromwich’s will as “my dear brother”. In this will of 1787, Thomas mentions Henry Isherwood as his nephew-in-law and leaves him certain bequests “as a reward for and token of his ffidelity and assiduity as a partner to me in business and his affection and good behaviour to me and my family”. 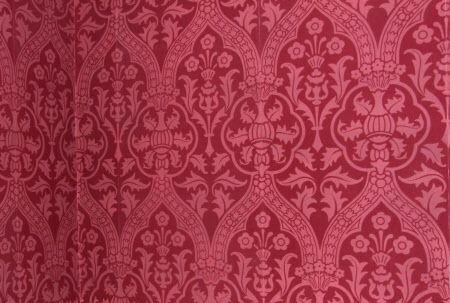 (1) Bromwich had been a paper-hanger and leather gilder at the Golden Lyon, 35 Ludgate Hill, since the 1740s and did not just supply wallpaper, but, according to one of his trade cards, also “all manner of screens, window blinds, covers for tables, rooms, cabins, stair-cases, etc.” In other words, all house decorations could safely be left in the hands of Bromwich & Co. 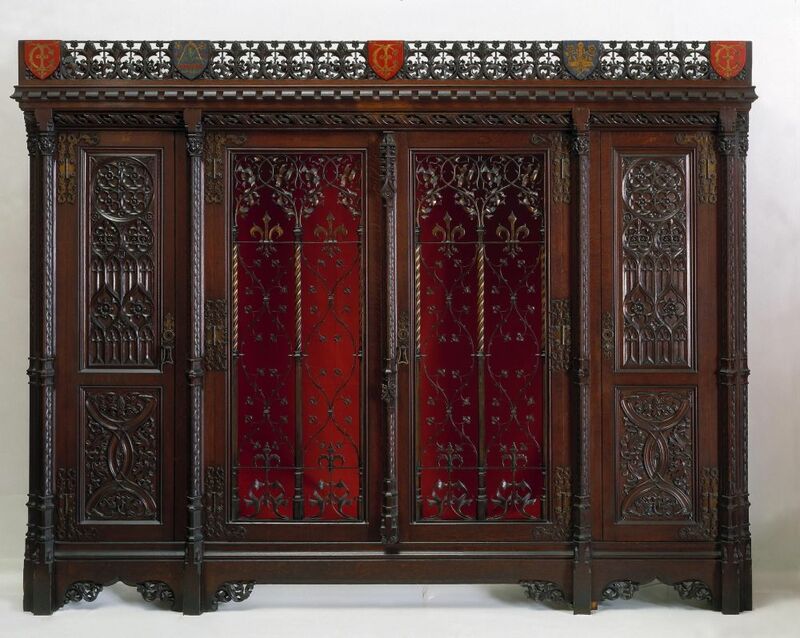 He worked, for instance, for Horace Walpole at Strawberry Hill House. 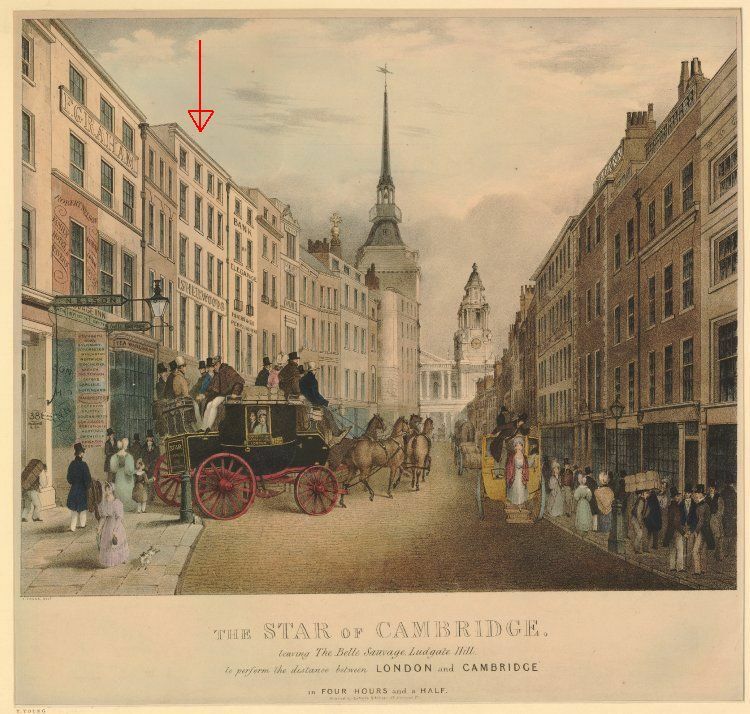 (2) The shop at 35 Ludgate Hill was situated on the left-hand side of Naked Boy Court and touched at the back upon the yard of the Belle Sauvage Inn. Later baptism records for Isherwood children show that the family also used the address of 6 Belle Sauvage Yard to describe their living quarters. Bromwich retired from the partnership in 1784 and Isherwood and Bradley remain in partnership until the death of Bradley in 1792 at the age of 55. They had used Bromwich’s name in their billhead as “(late partners with Mr. Bromwich)” as we can see, for instance, on a bill written out in May 1792 for William Drake for “a mans time and expences going to Roehampton”. 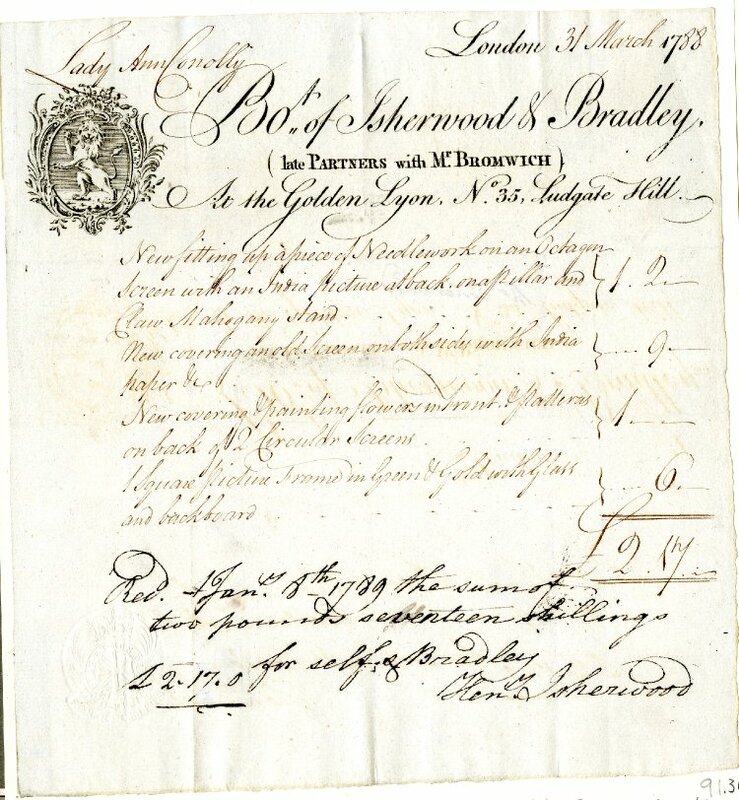 (3) This particular bill was paid in February 1793 and the receipt of the money was signed by N. Isherwood. And this is where we go back to the beginning of this post and Whalley. Nicholas, the elder son of Henry the blacksmith, died in 1775; his son Nicholas (baptised 1762) came to work in his uncle’s shop in London and married Sarah Fielding in 1796. 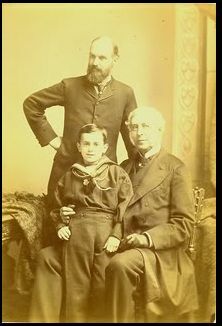 Uncle Henry and his wife Anna Maria Bromwich had one surviving son, Robert (born 1781), but he does not seem to have been involved in the business. He is always described as Esquire of Highgate and took on the management of the house and lands at Highgate that came to him via Thomas Bromwich, the widow Elizabeth Bromwich, and his father Henry Isherwood. (4) Henry Isherwood of Ludgate Hill died – suddenly according to the record of St. Bride’s – in 1812 and was buried on 3 February. 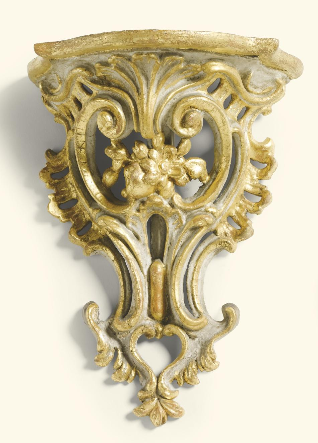 The next phase in the decorator’s business is that under the management of Nicholas Isherwood, Henry’s nephew. 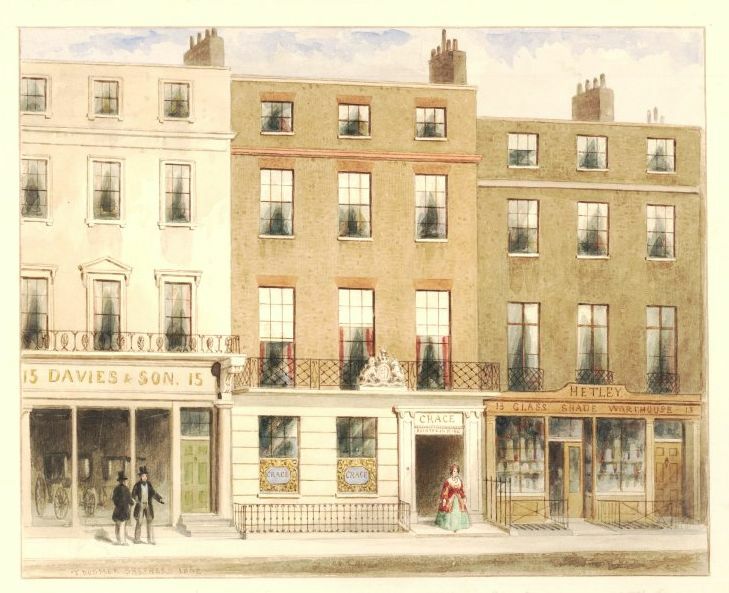 In 1818, his son Nicholas Thomas obtained his freedom of the Company of Stationers and the City by patrimony and three years later he married Elizabeth Ann Dawes. When their son Nicholas William Tertius was baptised in 1825, their address is given as 7 Racquet Court. Nicolas dies in 1829 and from his will, we learn that he and his son are in partnership and that he would like his wife Sarah to continue the business in partnership with his son. (5) And that is what happens. 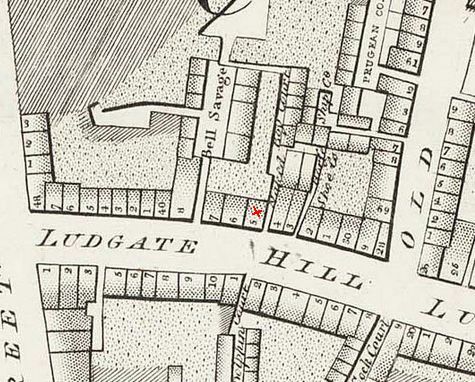 The 1841 census shows Sarah at 35 Ludgate Hill with her widowed daughter Mary Ann Daker and two servant. Where Nicholas Thomas is on the night the census is taken remains unclear. 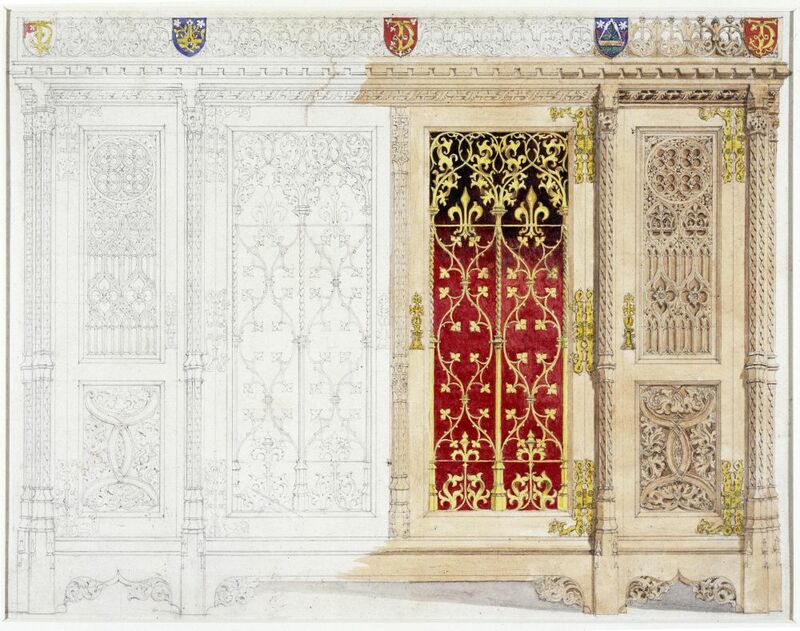 He may very well have been away on business as we know that the Isherwoods (and Bromwich before them) were frequently called upon to (re-)decorate country houses. [Update: he was at the cottage in Acre Lane, Brixton, see comment by Steve] Ten years later, Nicholas Thomas is at home at Ludgate Hill and his sister is still there as housekeeper. This time it is Sarah who is missing from the census. Things were not well with the business, however. On the 14th of November, 1851, a petition was filed at the Court of Bankruptcy against Nicholas Thomas and Sarah. While that in itself would not necessarily be a grave problem as many petitions were filed against shopkeepers and if they could satisfy their creditors, they could continue trading, but the Isherwoods were not able to turn things around and in December 1851, an advertisement announced the sale, not only of their furniture and household goods, but also of their stock in trade at 35 Ludgate Hill. 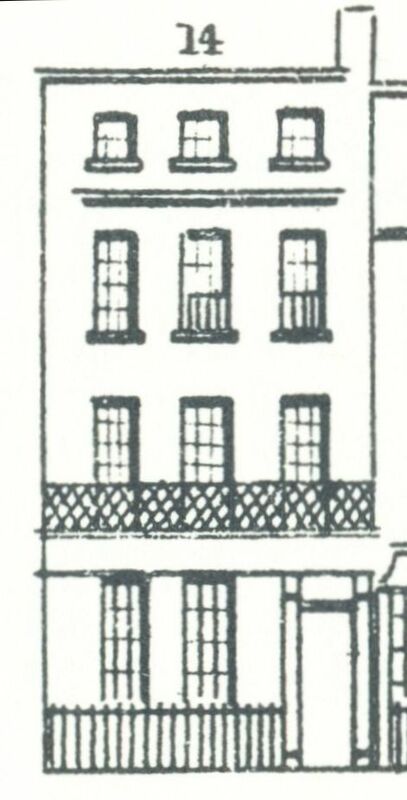 In March 1852, a cottage at Acre Lane that they owned was also put up for sale. (6) They had to move to Oxford Street and the building at number 35 was taken over by the Prudential Insurance Company for their headquarters. 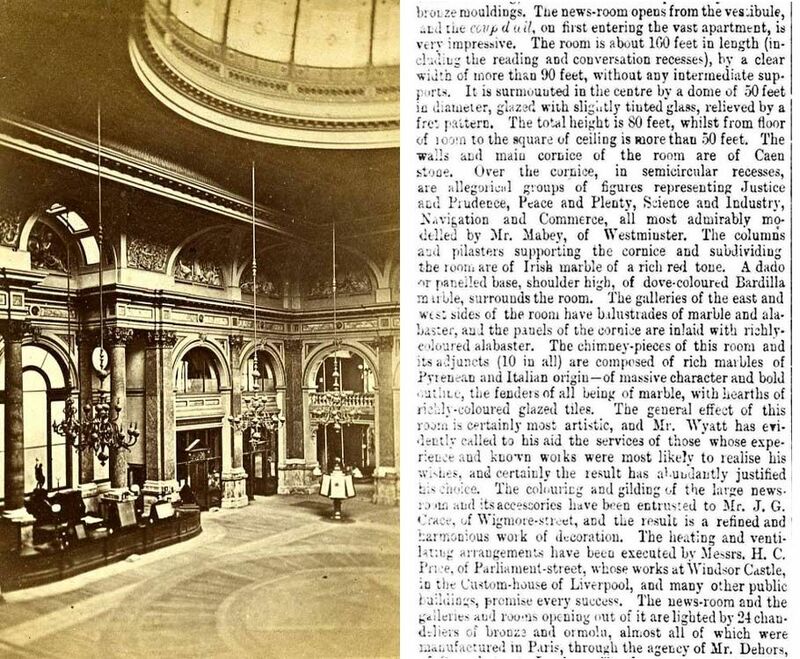 In March 1852, the Isherwood case came before the Bankruptcy Court and it was not a pretty picture. The total debt of Sarah and Nicolas was £3509 plus £753 for which security was held. Leniency was asked for Sarah who was almost 80 years old and as good as completely bedridden. 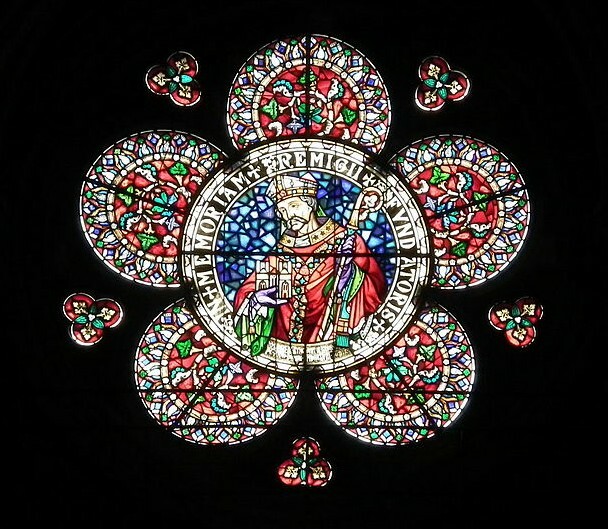 Sarah died in November 1853 and was buried at St. Bride’s on the first of December. 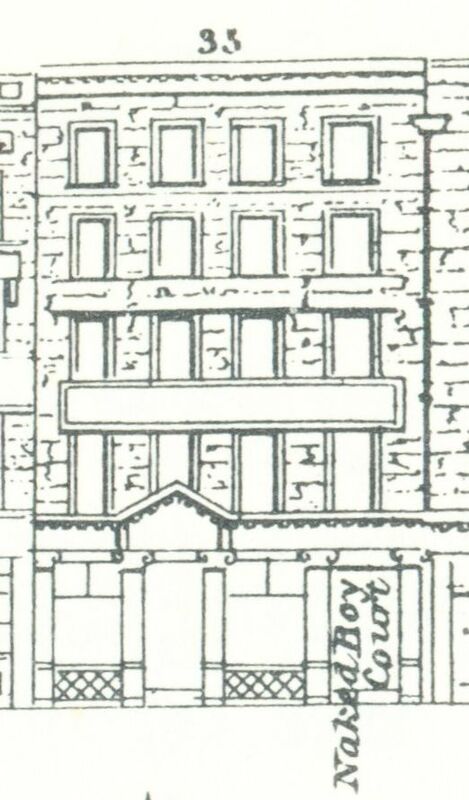 Her address was given as 493 New Oxford Street. 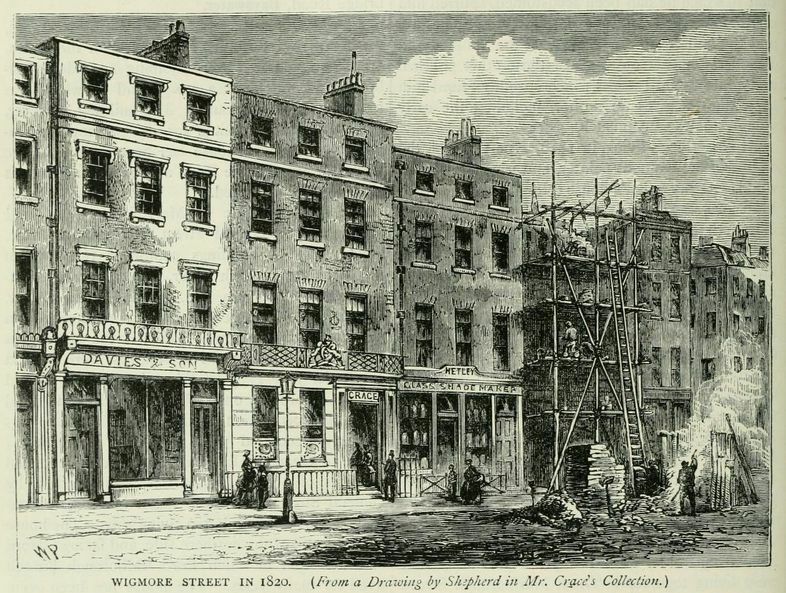 In 1858, Nicholas Thomas had to appear before the bankruptcy commissioners again and is then said to be “Formerly of 493, New Oxford Street, and now of 501a, Oxford Street … Paper Hanger, Decorator, House Agent and Appraiser”. The 1861 census does indeed find him at 501a Oxford Street, living with his sister Mary Ann Daker, her daughter Mary Ann who is a governess, and his own son Nicholas Wiliam Tertius. 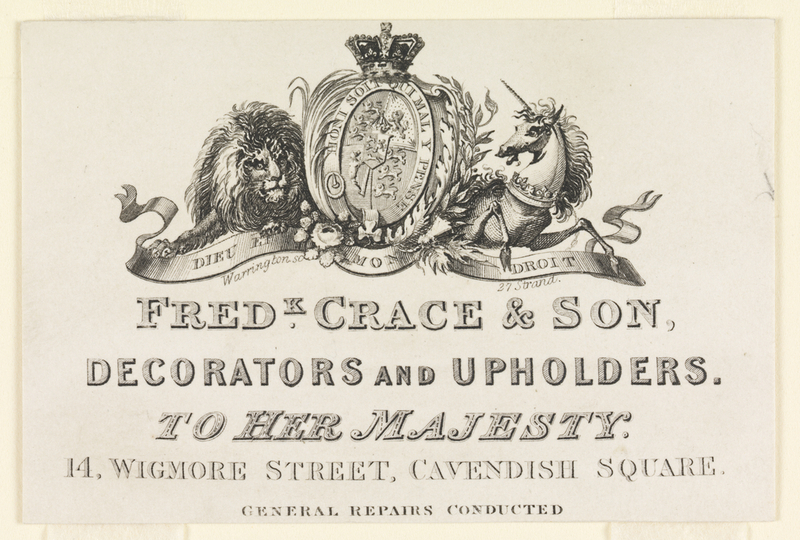 The men are both described as decorators. What happened subsequently is not entirely clear, but in the 1871 census, Nicholas Thomas can be found in Sutton’s Hospital of Charterhouse which provided accommodation for “men who had lived active and useful lives in conditions of prosperity and comfort and who had fallen on hard times through no fault of their own to finish their days in the kind of circumstances to which they had become accustomed”. “Through no fault of their own” may stretch the truth a little bit, but at least Nicholas had a few quiet years there before his death. 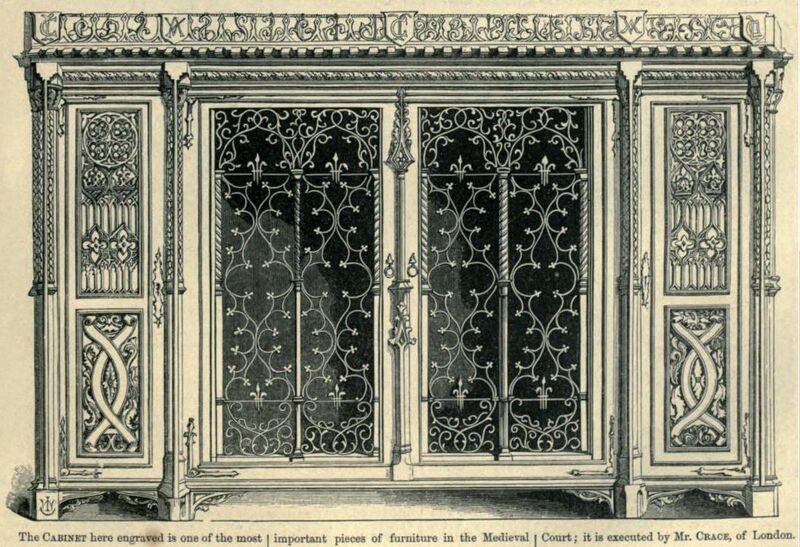 (2) Thanks to Louise Varma, weekend volunteer at Strawberry Hill House, whose question on Bromwich led me to do the research on the Isherwoods. 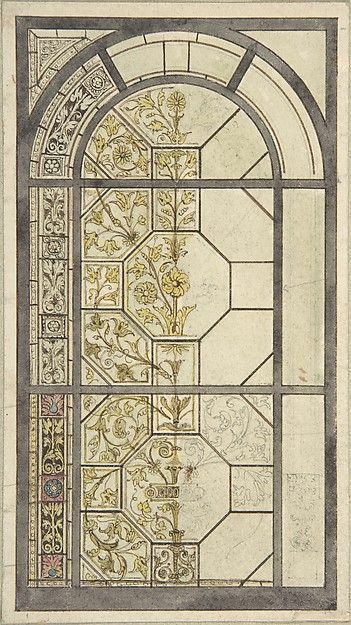 (3) This particular bill is in the British Museum, but the Centre for Buckinghamshire Studies have more records regarding the Drake family house at Roehampton. (4) Survey of London, volume 17, the Parish of St Pancras. Part 1, the Village of Highgate. 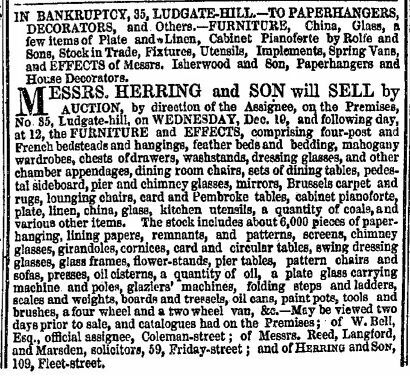 (6) Morning Chronicle, 12 March 1852. (7) Daily News, 27 March 1852. The certificate was duly given to Nicholas in March 1853.